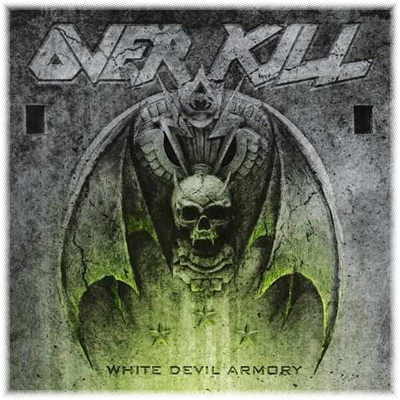 July 2014 Album of the Month - Overkill - "White Devil Armory"
2014 - july's album of the month - overkill - "white devil armory "
Most of you have known me for a long time, and for those of you who have, you know OverKill has been one of my favorite bands for a very long time. I used to call them the "modern day Motorhead". The reason for this is that they have been cranking out good album after good album and they have remained consistent all through their career. Much like Motorhead this band has endured changes in musical trends, stayed strong even when metal was considered uncool and they have influenced an entire generation of metalheads and bands. OverKill has recently seen a resurgence in their music. While I would still say they put out some good albums over the last 10+ years the last 3 albums they have put out have been by far in my opinion their best work. Ironbound was the first of these three albums that really started this trend. When this record came out it completely blew me away the same way that albums like Horrorscope, W.F.O. and Taking Over did when I was a kid in high school. First off the great thing that OverKill has done on these last three records was combine old school sound with a modern approach. White Devil Armory continues this trend. These guys just keep getting better and better with age. I have noticed this with quite a few thrash metal bands who formed and existed in the early to mid 80s. It's like there is this resurgence of thrash metal bands coming out and showing people just how it SHOULD be done. The difference between OverKill and some of those bands is that they never went away and have been showing people this for over 30 years now. If you liked the last couple of albums you will definitely love this album. It's absolutely amazing and you can't go wrong with this release!